Not to be confused with National Rail. Network Rail is the owner (via its subsidiary Network Rail Infrastructure Ltd, which was known as Railtrack plc before 2002) and infrastructure manager of most of the railway network in Great Britain. Network Rail is an arm's length public body of the Department for Transport with no shareholders, which reinvests its income in the railways. Network Rail's main customers are the private train operating companies (TOCs), responsible for passenger transport, and freight operating companies (FOCs), who provide train services on the infrastructure that the company owns and maintains. Since 1 September 2014, Network Rail has been classified as a "public sector body". To cope with quickly rising passenger numbers, Network Rail is currently undertaking a £38 billion programme of upgrades to the network, including Crossrail, electrification of lines, upgrading Thameslink and a new high-speed line. Britain's railway system was built by private companies, but it was nationalised by the Transport Act 1947 and run by British Railways until re-privatisation which was begun in 1994 and completed in 1997. Infrastructure, passenger and freight services were separated at that time. Between 1994 and 2002 the infrastructure was owned and operated by Railtrack. The Hatfield train crash on 17 October 2000 was a defining moment in the collapse of Railtrack. The immediate major repairs undertaken across the whole British railway network were estimated to have cost in the order of £580 million and Railtrack had no idea how many more 'Hatfields' were waiting to happen because it had lost considerable in-house engineering skill following the sale or closure of many of the engineering and maintenance functions of British Rail to external companies; nor did the company have any way of assessing the consequence of the speed restrictions it was ordering, which all but brought the railway network to a standstill. The costs of modernising the West Coast Main Line were also spiralling. In 2001, Railtrack announced that, despite making a pre-tax profit before exceptional expenses of £199m, the £733m of costs and compensation paid out over the Hatfield crash had plunged Railtrack from profit into a loss of £534m, and it approached the government for funding, which it then used to pay a £137m dividend to its shareholders in May 2001. Network Rail Ltd took over control by buying Railtrack plc, which was in "railway administration", from Railtrack Group plc for £500 million; Railtrack plc was then renamed and reconstituted as Network Rail Infrastructure Ltd. The purchase was completed on 3 October 2002. The former company had thus never ceased to exist but continued under another name: for this reason Network Rail Infrastructure Ltd was the defendant in later prosecutions in respect of events which had occurred in the days of Railtrack. UK total rail subsidies 1986–2015 (in 2015 terms), showing the huge increase after the Hatfield crash. Following an initial period in which Network Rail established itself and demonstrated its competence in addressing the principal challenges of improving asset condition, reducing unit costs and tackling delay, the Government's Rail Review in 2004 said that Network Rail should be given responsibility for whole-industry performance reporting, timetable development, specification of small and medium network enhancements, and the delivery of route-specific utilisation strategies (RUS). Some of these are functions which Network Rail already had; others – such as the obligation to devise route utilisation strategies – were transferred to Network Rail from the Strategic Rail Authority, a non-departmental public body, part of the UK government. The SRA was abolished in November 2006. The company moved its headquarters to Kings Place, 90 York Way, from 40 Melton Street, Euston, in August 2008. In October 2008, Sir Ian McAllister announced that he would not stand for re-election as chairman of Network Rail. He had held the position for six years. He noted that as Network Rail moved to a "new phase in its development" it was appropriate for a new chairman to lead it there. Many track safety initiatives have been introduced in the time Network Rail has been responsible for this area. The latest, announced in December 2008, known as "All Orange", states that all track personnel must not only wear orange hi-vis waistcoats or jackets, but must also wear orange hi-vis trousers at all times when working on or near the track. This ruling came into force in January 2009 for maintenance and property workers and in April 2009 for infrastructure and investment sites. In 2009, allegations appeared in the media from the Transport Salaried Staffs' Association concerning treatment of Network Rail employees. Former chief executive Iain Coucher was also accused of financial impropriety involving unspecified payments to his business partner Victoria Pender during his tenure at Network Rail. An internal investigation held by Network Rail in 2010, vetted by its auditors PricewaterhouseCoopers, uncovered no evidence of wrongdoing. An independent enquiry headed by Anthony White QC in 2011 further examined the claims, but also exonerated Coucher. Critical commentary appeared in the media concerning the knighthood awarded to John Armitt in the 2012 New Year Honours for services to engineering and construction. Armitt was Chief Executive of Network Rail at the time of the 2007 Grayrigg derailment and the family of a victim of the accident criticised the award, which coincidentally was conferred on the same day that Network Rail were prosecuted for the accident. In 2011 the company began the process of reorganising its operational structure into nine semi-autonomous regional entities, each with their own managing director; the first two units to be created were Scotland and Wessex regions. The reorganisation has been interpreted as a move back towards vertical integration of track and train operations. In 2016 Network Rail failed to check whether the Flying Scotsman could fit through tunnels along the Borders Route resulting in the cancellation of a trip just 24 hours before departure. The operator described the cancellation as "an absolute disgrace", Network Rail blamed the cancellation on an internal "administrative error". Just one day later Network Rail chose to change their mind and allow the train journey to take place. Scottish Transport Minister Derek Mackay branded the affair a "debacle". Network Rail's attempt to electrify the Great Western Main Line has been dogged by poor planning and cost overruns. The projected cost had increased from £1.2 billion to £2.8 billion by the end of 2015 and the project has been delayed to the point where the government has asked Hitachi to retrofit the new Intercity Express Programme trainsets with diesel as well as electric engines as the electrification has been scaled back. In December 2016, the Transport Secretary, Chris Grayling announced that Network Rail would lose sole control of track maintenance and repairs, and instead would share this with the Train Operating Companies. Sign showing the Network Rail name on the signal box at Ledbury. Network Rail owns the infrastructure, including the railway tracks, signals, overhead wires, tunnels, bridges, level crossings and most stations, but not the passenger or commercial freight rolling stock. It however owns a fleet of departmental stock. Although it owns over 2,500 railway stations, it manages only 20 of the biggest and busiest of them, all the other stations being managed by one or other of the various train operating companies (TOCs). Network Rail has a 15-year lease on Square One in Manchester with 800 staff in one of Manchester's largest refurbished office spaces. Network Rail should not be confused with 'National Rail'. National Rail is not an organisation, but merely a brand, used to explain and promote a Great Britain-wide network of passenger railway services. The majority of Network Rail lines also carry freight traffic; some lines are freight only. A few lines that carry passenger traffic are not part of the National Rail network (for example High Speed 1, Heathrow Express, Tyne and Wear Metro (the Tyne and Wear Metro uses Network Rail track between Pelaw and Sunderland and is responsible for that) and the London Underground). Conversely, a few National Rail services operate over track which is not part of the Network Rail network. For example, Chiltern Railways services run on track owned by London Underground between Harrow-on-the-Hill and Amersham. The current Chairman is Sir Peter Hendy, and Andrew Haines OBE was appointed as the Chief Executive in August 2018. Network Rail is funded partly through a direct grant from the government (£3.8 billion in 2015/16) and partly by train operating companies paying access charges to use the rail network (£1.6 billion in 2015/16). In 2015/16, it spent £3.1 billion on renewals (renewing existing infrastructure back to how it was when new) and £3.2 billion on enhancements, with the rest spent on maintenance and other costs. High-pressure water jets clearing leaves at Taunton. Network Rail covers 20,000 miles of track, and 40,000 bridges and tunnels. February 2004 saw the opening of an operations centre at Waterloo station in London, operated jointly by Network Rail and South West Trains. This was the first full collaboration of its kind since privatisation, and it is regarded as a model for other areas of the network, with a further six integrated Network Rail + TOC Control Centres having opened since then, at Blackfriars, Croydon (Leading Control for Thameslink), Swindon, Birmingham New Street, Glasgow and, most recently, Liverpool Street and South Wales based in Cardiff Canton. Track renewal, the ongoing modernisation of the railway network by replacing track and signalling, continues to be carried out by private engineering firms under contract. The biggest renewals projects include the multibillion-pound upgrade of the London – Glasgow West Coast Main Line, which was completed in 2008, the Thameslink Programme to upgrade the north-south railway through London and work on the part of Crossrail which is operated by Network Rail. Network Rail initially sub-contracted much of the work and the site to private infrastructure maintenance companies such as Carillion and First Engineering. Other sub-contractors are used on site for specialist work or additional labour. These include Prima Services Group, Sky Blue, Balfour Beatty, Laboursite, BCL, Atkins (Atkins Rail) and McGinleys. Since 2003 Network Rail has been building up significant in-house engineering skills, including funding of apprenticeship and foundation degree schemes. Network Rail reports significant savings resulting from the initial transfers of work away from contracting companies. Additional contracts were taken back by Network Rail after the serious accident at Potters Bar and other accidents at Rotherham and King's Cross led Jarvis to pull out of the track repair business. Shortly after this, and due to other failures by maintenance companies, Network Rail took control of many more maintenance duties. Telecomms maintenance came full circle in April 2009 with the bringing in house of the staff of Thales Telecom Services Ltd (formerly British Rail Telecommunications (BRT)). All workers working on, near or trackside have to undergo a Personal Track Safety assessment (re-assessed every two years). Network Rail workers undergo an assessment every year as part of AITL (Assessment in the Line). The AITL requires each worker to go through questions on a computer based program on all the competencies held. In 2007 it was announced that the number of track renewal contractors will be reduced to four from the current six. These are now Amey/SECO, Balfour Beatty, Babcock First Engineering and Jarvis plc. Jarvis went into administration in March 2010, with the bulk of its work commitments being picked up by Babcock. Network Rail High Speed also operates London St Pancras International High Level, Stratford International and Ebbsfleet International. Glasgow Central and Liverpool Lime Street stations are divided into high and low-level stations – the high-level stations are all termini used primarily by the main inter-city services to those stations. The low-level stations are through routes on local commuter networks that are largely separate from other routes to the main station; these platforms are not managed by Network Rail, but instead the rail operator that primarily uses them (Abellio ScotRail and Merseyrail respectively). Network Rail operated Gatwick Airport station until January 2012 when it was transferred to Southern, and Fenchurch Street until November 2014 when it was transferred to c2c. Network Rail took over management of Bristol Temple Meads and Reading in April 2014. A DfT franchise report in 2014 stated Network Rail's intention to subsume more major stations into Network Rail's directly operated portfolio. The report earmarked York for Network Rail management, as well as Manchester Oxford Road and Manchester Victoria which are currently undergoing major rebuilding as part of the Northern Hub. However as of September 2017[update] the two Manchester stations remain under the operatorship of Northern. Network Rail has several training and development sites around Britain. These include sites in York, Peterborough, Derby, Leeds, Walsall and Larbert which provide refresher courses, and train staff in new equipment. Advanced Apprentice Scheme trainees are trained at Network Rail's Westwood training centre for the first five months of their apprenticeship and then are trained further at HMS Sultan in Gosport over seven 2-week periods or five 3-week periods (throughout their second and third year) of their apprenticeship, using a combination of Royal Navy facilities and a specially installed training centre. All courses are taught by VT Flagship (part of Babcock International) in the first year but apprentices are trained by Network Rail staff in the second and third years. Network Rail bought a residential centre from Cable and Wireless in the Westwood Business Centre near Coventry for leadership development. The company and other industry partners such as VolkerRail and Balfour Beatty also operate a Foundation Degree in conjunction with Sheffield Hallam University. In 2008, Network Rail piloted its first qualification in "track engineering". It has been given permission to develop courses equivalent to GCSE and A-levels. Network Rail operates various essential telecommunication circuits for signalling and electrification control systems, train radio systems, lineside communications, level crossing CCTV, station information and security systems as well as more general IT and business telephony needs. The fixed bearer network infrastructure comprises transmission systems and telephone exchanges linked by a fibre optic and copper cable network that is located mainly within trackside troughing routes on the former British Rail Telecommunications network. (It is the largest private telecoms network in the UK). Network Rail operates several analogue radio networks that support mobile communication applications for drivers and lineside workers which consist of base stations, antenna systems and control equipment. The National Radio Network (NRN) was developed specifically for the operational railway; it provides radio coverage for 98% of the rail network through 500 base stations and 21 radio exchanges. The Radio Electronic Token Block RETB system is based on similar technology as the NRN and ORN but provides data communication for signalling token exchange as well as voice communication. Fixed communication at trackside is provided by telephone. These are primarily provided for signallers to communicate with train crew, via telephones mounted on signal posts, and with the public through telephones located at level crossings. GAI-Tronics provides many of the telephones sited on trackside and at level crossings. They also provide Public Access Help Points on platforms and stations to provide passengers with easy access to Information and Emergency control centres. GSM-R radio systems are being introduced across Europe under EU legislation for interoperability. In the UK, as of March 2014, Network Rail is well underway in the UK implementation of GSM-R to replace its legacy National Radio Network (NRN) and Cab Secure Radio (CSR) systems currently in use. Network Rail has an internal infrastructure database known as GEOGIS. The system uses codes for four-digit Track IDs to identify which line at any location is referred to. The first number refers to track direction, with values of 1 (Up), 2 (Down), 3 (Reversible/Bi-directional), or 4 (Merry Go Round Loop). The second number refers to track use, which can be 1 (Main or Fast), 2 (Slow, Local or Relief), 3 (Goods), 4 (Single line), 5 (Loop), 6 (Terminal or Bay), 7 (Crossover), 8 (Other or Engine), or 9 (Single Siding). The third and fourth numbers refer to the track number, which can be any number from 00 to 99 inclusive, and are usually numbered sequentially. Network Rail operates a large variety of DMUs, locomotives and rolling stock to perform safety checks and maintenance (this fleet is not to be confused with the combined rolling stock assets of ATOC members who work in combination as National Rail). As well as the multiple units and locomotives detailed below, Network Rail own and operate a large stock of rolling stock for particular testing duties and track maintenance. Network Rail also hire freight locomotives from various freight operators including DB Cargo UK, Freightliner, Colas Rail and GB Railfreight amongst others to operate engineers' trains in support of maintenance and renewal work. Network Rail's Infrastructure Monitoring fleet of test trains is operated by Colas Rail, primarily using locomotives from Colas' and Network Rail's own fleets, but also using locomotives hired from other companies such as Direct Rail Services, GB Railfreight and Europhoenix as required. Rail Passengers in Great Britain from 1829–2018, showing the early era of small railway companies, the amalgamation into the "Big Four", nationalisation and finally the current era of privatisation. From 1997 to 2014 (inclusive), passenger numbers have more than doubled, following little growth in the previous decades. To cope with the increasing passenger numbers, Network Rail is currently undertaking a £38 billion programme of upgrades to the network, including Crossrail, electrification of lines, in-cab signalling, new inter-city trains, upgrading Thameslink, and a new high-speed line. Each stage delivers an agreed set of outputs to defined quality criteria. The Secretary of State for Transport regularly issues a High-Level Output Specification (HLOS) indicating what work the Government wishes to be undertaken during a given Control Period. Strategic Routes in England and Wales 2014. Network Rail regularly publishes a Strategic Business Plan detailing their policies, processes and plans, as well as financial expenditure and other data. The most recent complete business plan was published in January 2013. Within these plans the rail network is divided into ten “devolved routes” or “operational routes”, with a Route Plan for each being published annually. Each route or other plan covers a number of railway lines usually defined by geographical area and the routes are further subdivided into 17 “strategic routes”, each divided into Strategic Route Sections (SRS) and given an SRS number and name. The plans also detail the geography of routes, stations, major junctions, capacity constraints and other issues and provide data on freight gauge, electrification, line speed, number of tracks, capacity and other information. The plans also detail the expected future demand and development of each route, their predicted expenditure and their maintenance and investment requirements. The devolved routes were introduced in 2011, and the 17 strategic routes labelled "A" to "Q" were introduced in 2010. From 2004 to 2009, the network had been divided into 26 strategic routes numbered "1" to "26". In 2003, the network had been divided into 41 strategic routes numbered "1" to "41". The 2011 devolved routes and strategic routes are organised as in the table below. Network Rail opened the world's largest solar-powered bridge at Blackfriars Bridge across the River Thames in January 2014. The roof of the bridge has been covered with 4,400 photovoltaic panels, providing up to half of the energy for London Blackfriars station. The company is accountable to a body of members through its corporate constitution, to its commercial train operator customers through its contracts with them (the contracts are subject to regulatory oversight), and to the public interest through the statutory powers of the Office of Rail and Road (ORR). Since Network Rail does not have shareholders, its members hold the board of directors to account for their management of the business. From 1 July 2015 all the members were removed leaving the special member, the Secretary of State for Transport, as the sole member of Network Rail. Previously at any one time there were around 100 members in total, drawn from a wide range of industry partners and members of the public. There were two general categories of membership, industry members comprising any organisation holding a licence to operate on the railway or preferred bidder for a railway franchise, and public members who were drawn from the wider stakeholder community. Members were appointed by an independent panel and served a three-year term. They had a number of statutory rights and duties which included attending annual general meetings, receiving the Annual Report and Accounts, and approving the appointment or re-appointment of Network Rail’s directors. Members had a duty to act in the best interests of the company without personal bias. They received no payments other than travel expenses. Setting the strategic direction and the day-to-day management of Network Rail is the responsibility of the company’s board of directors. That direction must be consistent with the regulatory jurisdiction of the ORR, and with the requirements of its contracts. The ORR in turn operates within the overall transport policy set by the UK Department for Transport and the Scottish government, including as to what the government wants the railway industry to achieve and how much money the government is prepared to put into the industry. This means that the degree of government influence and control over the company is higher than it was before these enlargements of the powers and role of the government were introduced by the Railways Act 2005. The Office of Rail and Road (ORR) monitors Network Rail's performance on a continuous basis against targets established by the regulatory authority in the most recent access charges review (2003), against obligations in the company's network licence and against forecasts in its own business plan. If performance is poor, the company will face criticism and possible enforcement action from its commercial customers (under their contracts) and from the ORR (enforcing the company's network licence). It may also be criticised by its members in general meeting. In the annual report 2014/15, the ORR reported that the Public Performance Measure (PPM) was 89.6%, 1.4 percentage points (pp) below target in England and Wales, and PPM in Scotland was 90.5%, 1.5pp below its regulatory performance target of 92%. Network Rail’s Business Planning Criteria, Business Plan and Route Plans. 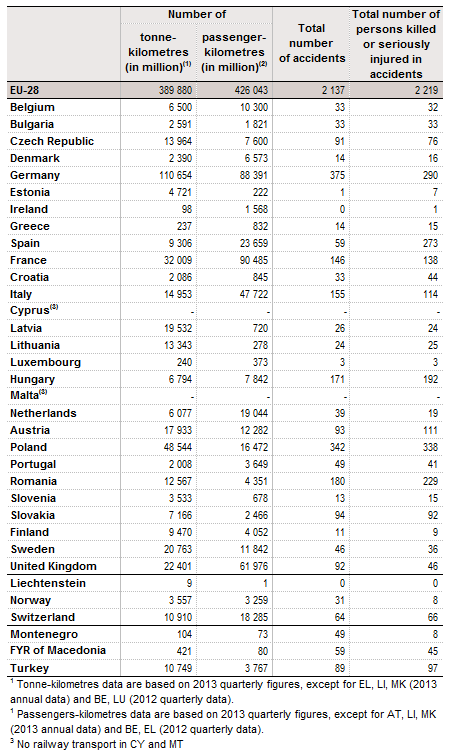 2013 Rail fatalities per billion passenger-km in European countries. While generally good, the safety record of the company was marred in February 2007 when a Virgin express derailed at Grayrigg in Cumbria. Network Rail admitted responsibility for the incident. The RAIB investigation concluded in 2009 that a faulty set of points had caused the derailment. In 2012 the Office of Rail Regulation announced that Network Rail was to be prosecuted under the Health and Safety Act for "failure to provide and implement suitable and sufficient standards, procedures, guidance, training, tools and resources for the inspection and maintenance of fixed stretcher bar points". Network Rail pleaded guilty and were fined £4.1 million including legal costs. In December 2005 two young girls were killed by a train as they were crossing the railway line via a pedestrian level crossing at Elsenham in Essex. Network Rail was prosecuted for breaching health and safety law and fined £1 million in March 2012. The court heard that risk assessments carried out by Network Rail staff in 2002 had identified potential dangers with the crossing and recommended the installation of gates that would lock automatically as trains approached, but this was not acted upon. In 2001 the then Labour government denied that it had nationalised the rail network in order to prevent Railtrack's shareholders claiming, via the European Court of Human Rights, the four-year average price of Railtrack, about £10 per share. Instead, Railtrack's shareholders were given only £2.60. The Times reported that Gordon Brown's aide, Shriti Vadera e-mailed Stephen Byers in July 2001 asking: "Can we engineer the solution through insolvency ... and therefore avoid compensation under the Human Rights Act?" Railtrack plc was placed into railway administration under the Railways Act 1993 on 7 October 2001, following an application to the High Court by the then Transport Secretary, Stephen Byers. It was reported in November 2001 that a further £3.5 billion might be needed to keep the national railway network running, a sum disputed by Ernst & Young, the administrators. To get Railtrack out of administration, the government had to go back to the High Court and present evidence that the company was no longer insolvent. The principal reason given by the government to the court for this assertion was the decision of the rail regulator in 2002 to carry out an interim review of the company's finances, with the potential to advance significant additional sums to the company. The High Court accepted that the company was not insolvent, and the railway administration order was discharged in October 2002. Until 2013 there was discussion over whether Network Rail is a public-sector or a private-sector entity. Although it was officially a private sector organisation, the fact that its debts were underwritten by the government, and it is partly funded by the government, has led to its being described as being "nationalisation in all but name". It was also claimed that the government is keen for Network Rail not to be classified as a public-sector organisation, as this would mean that the company's debt would be counted as public expenditure liabilities. The Office for National Statistics (ONS) repeatedly clashed with the National Audit Office and the Statistics Commission over whether the successor to Railtrack should be considered a private company – as the ONS believed – or included on the Government's books, as the National Audit Office argued. The NAO said that as the Government is bearing the risk that would normally be borne by equity capital, and as it can appoint, through the SRA, a director who cannot be removed by members, Network Rail is effectively a subsidiary of the Government-controlled SRA. In December 2013 the ONS announced that from September 2014 Network Rail will be classified as a "government body". This resulted in the company's debt of £34 billion being added to the national debt. In the 2016–17 financial year Network Rail's net debt rose from £41.6 billion to £46.3 billion. The new national centre now known as 'The Quadrant:MK' is in Milton Keynes: it completed construction in June 2012. The complex is five minutes' walk from Milton Keynes Central. The four buildings, which are connected to a central street, accommodate about 3,000 people. As of June 2012[update], the engineering, logistics, operations including timetable planning, IT, procurement, planning and finance departments all planned to move to the Quadrant. Network Rail organises the Landscape Photographer of the Year competition. Shortlisted photos are displayed at London Waterloo and other major stations. ^ "Our legal and financial governance structure". Network Rail. Archived from the original on 11 May 2016. ^ a b "Our Board – Structure and Governance". Archived from the original on 6 March 2014. Retrieved 6 March 2014. ^ "Income statement for the year ended 31 March 2013". Annual Report 2013. Network Rail. Archived from the original on 20 July 2013. Retrieved 6 March 2013. ^ "The way we work – Our people". Annual Report 2013. Network Rail. Archived from the original on 26 July 2013. ^ Network Rail Archived 7 November 2007 at the Wayback Machine Retrieved 25 May 2009. ^ "Reclassification as a public sector body – Supplying us". Network Rail. Archived from the original on 11 December 2015. ^ "Four dead in Hatfield Train Crash". BBC News. 17 October 2000. Archived from the original on 7 March 2008. ^ "Railtrack shuts down West Coast Main Line". BBC News. 25 October 2000. Archived from the original on 10 November 2013. ^ "Repair costs spiral to £5bn". BBC News. 15 December 1999. Archived from the original on 10 November 2013. ^ Leathley, Arthur (25 May 2001). "Railtrack in line for all-clear on borrowing". The Times. London. ^ Osborne, Alistair (6 June 2001). "Railtrack shares dive to all time low". The Daily Telegraph. London. Archived from the original on 12 March 2011. Retrieved 20 May 2010. ^ "Network Rail closer to Railtrack takeover". BBC News. 18 September 2002. Archived from the original on 17 September 2009. Retrieved 20 May 2010. ^ "ORR Subsidy data". Archived from the original on 27 September 2016. ^ "Network Monitor (Great Britain)" (PDF). Office of Rail Regulation. 31 March 2006. Archived from the original (PDF) on 27 March 2009. ^ "Strategic Rail Authority annual report and accounts period ended 30 November 2006". Archived from the original on 7 July 2015. Retrieved 7 July 2015. ^ "Network Rail boss stepping down". BBC News. 3 October 2008. Archived from the original on 6 October 2008. Retrieved 8 October 2008. ^ Railstaff (December 2008). "Track Safety". Railway People. Archived from the original on 4 March 2016. Retrieved 27 January 2017. ^ Milmo, Dan (23 May 2011). "Iain Coucher set to be cleared of misusing Network Rail funds". The Guardian. Archived from the original on 10 November 2013. Retrieved 9 March 2012. ^ Hough, Andrew (28 January 2011). "Network Rail: inquiry launched into 'misuse of public funds and illicit payments'". The Daily Telegraph. London. Archived from the original on 14 May 2018. ^ "Cash inquiry moves closer for Network Rail". The Financial Times. 13 October 2010. ^ "Grayrigg crash victim's son 'disgusted' by knighthood". BBC News. 1 March 2012. Archived from the original on 2 March 2012. Retrieved 2 March 2012. ^ "Network rail moves to create devolved business units" (Press release). Network Rail. 21 February 2011. Archived from the original on 25 February 2011. ^ Armitstead, Louise (22 February 2011). "Network Rail break-up revealed". The Daily Telegraph. London. Archived from the original on 24 March 2016. ^ Russell, Jonathan (21 February 2011). "Network Rail has taken the first step towards recoupling tracks and trains". The Daily Telegraph. London. Archived from the original on 24 March 2016. ^ "Flying Scotsman Borders trip cancelled". BBC News. 13 May 2016. Archived from the original on 4 February 2017. Retrieved 3 February 2017. ^ BBC (14 May 2016). "Flying Scotsman Borders Railway and Forth Bridge trip back on". Archived from the original on 4 February 2017. Retrieved 3 February 2017. ^ "Rail users will pay price for failure in investment planning". 20 November 2015. Archived from the original on 30 November 2016. Retrieved 24 March 2017. ^ "Great Western Disaster". 3 March 2017. Archived from the original on 25 March 2017. Retrieved 24 March 2017. ^ "Electrification dubbed 'shambles' as multi-billion pound electric trains may also have diesel engines because tracks won't be ready". 19 October 2015. Archived from the original on 1 September 2017. Retrieved 24 March 2017. ^ "Network Rail to be stripped of control over Britain's train tracks as operators will win power to improve services". Archived from the original on 26 December 2017. ^ Rawlinson, Kevin (2 December 2016). "Network Rail to lose sole control of rail maintenance". The Guardian. Archived from the original on 13 January 2017. Retrieved 27 January 2017. ^ "Network Rail 'to be stripped of monopoly over running Britain's railway tracks'". Archived from the original on 3 December 2016. ^ a b "Our stations". Network Rail. Archived from the original on 28 February 2017. ^ "Network Rail moves into old depot". Archived from the original on 26 October 2016. Retrieved 26 October 2016. ^ "GB rail industry financial information 2015–16" (PDF). Archived (PDF) from the original on 22 February 2017. ^ "Our history". Network Rail. Archived from the original on 21 January 2012. Retrieved 14 December 2011. ^ "UK brings infrastructure maintenance back in-house". Archived from the original on 26 October 2016. ^ "Our plan for rail in Britain". Archived from the original on 26 October 2016. ^ Aitchison, Gavin (21 November 2006). "Leaves on line cause rail delays". The Press. York: Newsquest. Archived from the original on 6 March 2016. ^ "A guide to personal track safety" (PDF). Archived from the original (PDF) on 18 February 2015. ^ "Network Rail Announces Track Renewal Changes". News Releases. 11 September 2007. Archived from the original on 27 October 2016. ^ "Jarvis to call in administrators". BBC News. 25 March 2010. ^ "Our stations". Network Rail. Archived from the original on 18 April 2018. Retrieved 19 April 2018. ^ "Railnews: Royal opening for modernised Reading". July 2014. Archived from the original on 3 April 2015. Retrieved 22 December 2014. ^ Department for Transport Rail Executive (June 2014). "Growth and Opportunity: TransPennine Express Prospectus" (PDF). p. 82. Archived (PDF) from the original on 25 April 2017. Retrieved 3 February 2017. ^ "Manchester Oxford Road station facilities". Network Rail. Archived from the original on 11 September 2017. Retrieved 10 September 2017. ^ "Manchester Victoria station facilities". Network Rail. Archived from the original on 17 August 2011. Retrieved 20 September 2017. ^ "Advanced Apprenticeship Scheme". Network Rail. Archived from the original on 26 October 2016. ^ "McDonald's 'A-level' is launched". BBC News. 27 January 2008. Archived from the original on 6 March 2016. ^ a b "The GRIP process". Archived from the original on 26 October 2016. ^ Department for Transport (16 July 2012). "Policy paper: High level output specification 2012". Archived from the original on 25 April 2017. Retrieved 27 January 2017. ^ a b "Strategic business plans 2014–19". Network Rail. Archived from the original on 16 January 2013. Retrieved 20 February 2013. ^ a b "Network and Route Specifications". Network Rail. Archived from the original on 30 March 2015. Retrieved 21 March 2015. ^ "Network Rail Route Plans Introduction" (PDF). Network Rail. Archived from the original (PDF) on 7 June 2011. Retrieved 20 May 2009. ^ "Network specifications archive". Network Rail. Archived from the original on 1 April 2015. Retrieved 21 March 2015. ^ "Route Plans archive". Network Rail. Archived from the original on 2 April 2015. Retrieved 21 March 2015. ^ World's largest solar-powered bridge opens in London Archived 2 February 2017 at the Wayback Machine The Guardian 22 January 2014. ^ Playing Our Part: Corporate Responsibility Report 2006 (PDF). London: Network Rail. July 2006. Archived (PDF) from the original on 19 December 2008. ^ Office of Rail and Road (2017). "Office of Rail and Road". Archived from the original on 27 January 2014. Retrieved 27 January 2017. ^ "Our members". Network Rail. Archived from the original on 10 September 2015. Retrieved 19 July 2015. ^ "ORR Annual report 2014–15" (PDF). Archived (PDF) from the original on 4 March 2016. ^ "CP5 Enhancements Delivery Plan" (PDF). p. 5. Archived from the original (PDF) on 8 December 2015. ^ a b c "Annual report and accounts 2014" (PDF). Network Rail. 1 July 2014. Archived from the original (PDF) on 5 February 2015. ^ "Eurostat accident and passenger usage statistics". Archived from the original on 2 February 2017. ^ "Derailment at Grayrigg 23 February 2007" (PDF). Rail Accident Investigation Branch. 2009. Archived from the original (PDF) on 17 October 2014. ^ "Network Rail appoints new boss Mark Carne". BBC News Online. 5 September 2013. Archived from the original on 23 November 2013. Retrieved 6 March 2014. ^ Rawlinson, Kevin (5 April 2012). "Network Rail fined £4m over 'preventable' crash". The Independent. Archived from the original on 29 May 2013. Retrieved 6 April 2012. ^ "Network Rail fined £1m over girls' level crossing deaths". BBC News. 15 March 2012. Archived from the original on 15 March 2012. Retrieved 16 March 2012. ^ Ward, Lucy (30 July 2001). "Rail buy-out too costly for government". The Guardian. London. Archived from the original on 25 August 2013. Retrieved 20 May 2010. ^ Jenkins, Simon (17 July 2005). "Railtrack shares trial exposes ministers with a license to steal". The Times. London. Retrieved 30 June 2018. ^ "Railtrack goes bankrupt with debts of £3.3bn". The Independent. 8 October 2001. Archived from the original on 12 March 2011. ^ "Blair told: find £3.5bn or the railways collapse". The Guardian. London. 24 November 2001. Archived from the original on 10 May 2017. ^ "Windsor's pointer to rail billions". The Daily Telegraph. London. 25 September 2002. Archived from the original on 1 March 2018. ^ Elliott, Larry (28 November 2006). "Greenback is getting a pounding". The Guardian. London. Archived from the original on 10 November 2013. Retrieved 29 March 2010. ^ a b Stewart, Heather. "Network Rail to be 'government body', adding £30bn to UK national debt". The Guardian. Archived from the original on 19 December 2013. Retrieved 22 December 2013. ^ Litterick, David (1 November 2002). "Statisticians wrangle over Network Rail accounting treatment". The Daily Telegraph. London. Archived from the original on 19 November 2009. Retrieved 19 November 2009. ^ Litterick, David; Osborne, Alistair (19 November 2002). "Statistics head acts in Rail row". The Daily Telegraph. London. Archived from the original on 19 November 2009. Retrieved 19 November 2009. ^ Ames, Chris (20 July 2017). "Network Rail debt rises by £5bn as it struggles with record spending". TransportNetwork. Hemming Media. Retrieved 20 November 2018. ^ a b Network Rail opens The Quadrant:MK Archived 13 January 2016 at the Wayback Machine The Railway Gazette, 1 June 2012. ^ The Times "Britain's best views: highlights from the 2017 Take a View Landscape Photographer of the Year awards". The Times. 15 October 2017. Retrieved 25 January 2018. Wikimedia Commons has media related to Network Rail.